The Problem of Searching for new Imperatives in Britain' s Colonial Policy during the second term of the D. Lloyd-George's Coalition Cabinet's Government (1918-1922 гг.). 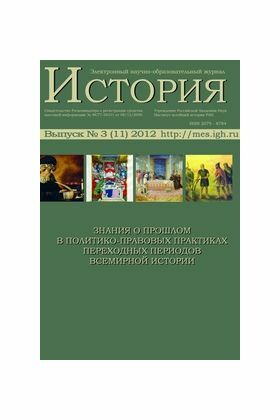 The trends and characteristics of the Russian novistics during transitional period of methodological transformation of the 1920-s. The First World War and the ‘transitivity’ state of the German society in the Weimar Republic: political appraisal of ‘conservative revolution’ at the present.